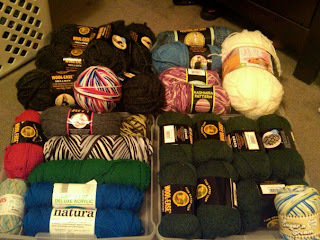 Some of my yarn... I need to find a new way to store it, it's spilling out everywhere! The black is for a sweater, the green on the lower right is for a sweater, and everything else is up for potential projects yet to be determined. The hat I'm working on for my friends daughter. Writing up the pattern as I go (I'll post it when I'm done). This is my first experience using the moss stitch. It's going very well, I'm done with the hearts now (4 hearts going around the whole hat). Maybe I'll be ambitious and write out the pattern for kids & adults. The bane of my knitting existence: The never ending scarf. It will look great when it gets blocked up and is actually FINISHED, but I just got so tired of knitting on it. 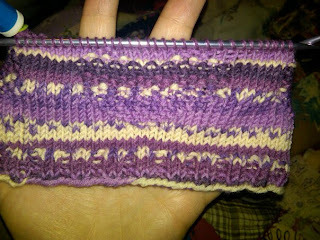 I do a row or two every week or so. I really should just take it off the needles and put it on a stitch holder, but I'm lazy. 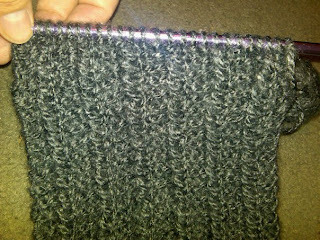 I'm also working on another of my cabled hats for a friend from school. Happy New Year everyone, and happy knitting!